If you’ve watched pretty much any action movie from the past thirty years, you’ve no doubt seen it before: the haggard hero taking a weary sip of Dutch courage from a hip flask and carrying on fixing a motorbike as if nothing happened. But, while you might fancy yourself as sharing the swagger and the attitude, you’ve been missing the equipment: until now. 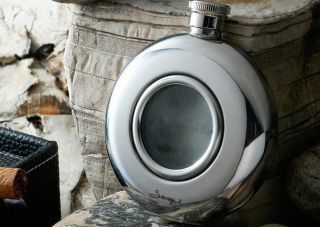 We’ve rounded up our list of the best hip flasks for every type of hero, whether you’re more a James Bond taking a wee dram in the grounds of Skyfall Lodge, a Don Draper having a cheeky nip of Scotch with some businessman pals, or even a Marilyn Monroe having a sip from her garter flask in Some Like it Hot. Less bulky and unwieldy than a full-sized Thermos, and often more suited to formal occasions (although we couldn’t possibly comment on the suitability of when and where to take a furtive sip) thanks to a range of sleek designs, a hip flask makes a great gift either for a loved one or just for yourself. Some are specially designed for a particular purpose, with some particularly oddball designs including integrated shot glasses for sharing, and others splitting into two individual decanters for romantic dates in the great outdoors. Realistically though, it’s mostly down to what you like in the design, so whether you like traditional tweed or leather, modern steel or pewter, or even plastic (trust us on this one) there’s something for all. Useful, hard-wearing, stylish and luxurious don’t have to be mutually exclusive when it comes to hip flasks, as this version from Danish designer Eric Magnussen in conjunction with Royal Selangor shows. Ultimately, it’s that combo that gives it our top spot. It has the smallest capacity of any of our picks, offering up 160ml of grog on the go, so while we wouldn’t recommend it for the longest trips, it makes a sleek, pocketable, and covetable accessory for day or night with its fine pewter construction and minimal look. Whoever came up with the bright idea of the double hip flask deserves to have a toast dedicated to them, don’t you think? After all, we can think of little more romantic after a cold winter walk than snuggling up with your love on the picnic blanket and sharing a sip of something warming, and the kicker is, you don’t even have to drink the same thing. Whiskey for you, rum for them, two beautiful, individual leather-bound decanters in one compact package — truly a match made in heaven. There’s really very little more elegantly masculine than a hip flask that also just so happens to be wrapped in official Harris Tweed. This 6oz flask seems to be perfectly engineered for gifting to your favourite outdoorsman (paired with a fine bottle of Islay, of course), with its combination of unique genuine tweed in mossy green and black, handwoven in the Outer Hebrides; accents of smooth cognac-coloured leather; and elegant presentation box. Warmer than leather and much warmer than steel, it’s also kinder on cold hands in chilly weather. The Stanley Adventure E-Cycle’s charm lies in its suitability to life outdoors. Unlike the easy-to-scratch exterior of fine polished metals, it’s hard-wearing enough to be thrown in a kit bag for camping or particularly strenuous walks thanks to a recycled plastic body that also - good news for the nervous - happens to be BPA free. It’s dishwasher safe and leak-proof, suited to mixed drinks as well as straight spirits, and looks like a cross between a Zippo lighter and a miniature oil drum: in a word, it’s rugged, and thus perfect for the budding Bear Grylls. Everyone has one friend who starts a chant of “shots, shots, shots!” way too early into the night — if you can’t think of anyone, it’s you — so why not get friendly revenge on them with this innovative hip flask? It features an integrated collapsible shot glass for nips (and dares) on the move, and with its two separate containers, is a great way to share, especially if you’re a bit of a germaphobe. This flask’s party functionality is belied by its exterior though, which is ever so grown-up in stainless steel and black bonded leather.